“Who are you? What are you doing here?” When we got to La Piedrita, they already knew we were coming. If not for the phone call they received from a trusted comrade, then from the video cameras lining the perimeter of this revolutionary zone that jealously guards its autonomy from all governments, right or left. Excerpted from the introduction to the new book We Created Chávez: A People’s History of the Venezuelan Revolution. Copyright Duke University Press, 2013. Just minutes before, my photographer and I had been enjoying the warm June dusk a few blocks below, near a small park in the Monte Piedad neighborhood of 23 de Enero, a notoriously revolutionary area of western Caracas perched precariously above Miraflores Palace, the nominal seat of state power. We were chatting, laughing, drinking beer and miche—a surprisingly potent homemade firewater distilled from sugarcane—while others play dominos, when a new friend raised the inevitable question of why we were there. “Well then, you must meet Valentín,” this new friend insists, and I know immediately just who it is that he means. Valentín Santana is the historic leader, the iconic figurehead, and the most publicly recognized member of La Piedrita. After a few frenetic phone calls in which our proposed visit is repeatedly rebuffed, our persistence pays off and we are cleared to head up to La Piedrita. We begin the climb upward, past Blocks 5, 6, and 7 of 23 de Enero, after which the multicolored superblock towers for which the area is famous give way to shorter blocks that are grouped tightly to form large, enclosed squares that are, from a military perspective, easier to defend. They knew we were coming, and yet they performed surprise, hostility, and militant discipline. Here, gun pointed at my chest, I can’t help but feel like a young Herbert Matthews in the Cuban Sierra Maestra (in fact, La Piedrita adjoins the Sierra Maestra sector of 23 de Enero). Matthews, so the story mistakenly goes, was duped by Cuban guerrilla commander Fidel Castro, who in 1957 allegedly marched a small number of troops in circles past the New York Times journalist to exaggerate the strength of his forces. Although this description of events has since been discredited, Matthews’ name became synonymous with journalistic naïveté. This lesson notwithstanding, the power of guerrilla theater has not waned, with revolutionary movements—from the Sandinistas to the Zapatistas and beyond—increasingly fighting their battles in the media and the reactionary forces arrayed against them doing the same. But as I sit here witnessing a similar display, it dawns on me that there is little disconnect between image and actuality, that managing appearances is the performative equivalent to managing reality. La Piedrita’s show of force itself requires the same sort of autonomous local control that it seeks to perform: the image is the reality, and the reality is one of radical autonomy from the state. This autonomy is not limited to the revolutionary context of contemporary Venezuela; La Piedrita has been fighting for more than 25 years. 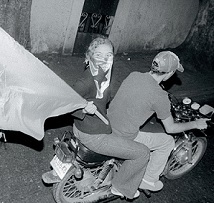 Like many of the collectives dotting the revolutionary landscape of western Caracas, La Piedrita emerged as a spontaneous community response to the scourge of narcotrafficking, as young revolutionaries—imbued with the history and ideology of struggles past—confronted both the drug trade and the violently corrupt state that facilitated it. The collective’s beginnings were modest, with a single member (Santana himself) devoted to what he calls trabajo de hormiga, “ant work”: publishing a small community newsletter that interwove references to Che Guevara with recipes and birthday wishes. This same spirit of humility was reflected in their chosen name, which refers to a “pebble,” little more than a mild nuisance. But La Piedrita would soon be something more than a nuisance to malandros (delinquents) and police alike, stamping out the drug trade entirely and effectively forcing the police out of their community. Today, La Piedrita’s autonomous status is best expressed by the large, hand-painted sign that greets all visitors: “Here La Piedrita gives the orders and the government obeys.” This is no exaggeration: the Chávez government once sent a captain of the military reserves into the zone, who was immediately taken into custody by the collective. When the official protested, explaining that he was merely there to scope out a possible escape route for the president in the event of a repeat of the 2002 coup, the response from La Piedrita was unambiguous: the government does not tell us anything, it must ask. As I await Santana’s arrival for my interview, the air in this corner of 23 de Enero is thick with tension. After a pipe bomb exploded prematurely while being placed outside the offices of the radically anti-Chavista chamber of commerce, Fedecámaras, on February 24, 2008, government forces determined that a militant who was killed accidentally called this area home. Although Fedecámaras is widely loathed among Chavistas for participating in the short-lived 2002 coup in which Chávez was briefly replaced with the organization’s then-head Pedro Carmona Estanga, planting pipe bombs was beyond the pale. For the first time in years, ever since these local militias had reached a sort of détente with the central state, police entered the area, searching homes for suspects associated with the self-styled “Venceremos Guerrilla Front,” whose name appeared on flyers found at the scene. For many, including Valentín Santana and La Piedrita, this unwelcome incursion was an open attack on their tradition of local autonomy, and they responded by making that autonomy perfectly clear: on April 3, a multitude of local collectives including La Piedrita engaged in an “armed blockade” of 23 de Enero, appearing publicly in ski masks and armed to the teeth to shut down the community with burning tires and barricades as a sharp warning to the government. Chávez issued a stern rebuke on his television program Aló Presidente, insisting that “these people don’t look like revolutionaries to me, they look like terrorists”; he even suggested that they had become infiltrated tools of the cia. I am struck by the soft-spokenness of this militant organizer, who, with his light skin and army-green cap, looks more like an Irish Republican Army member than the bearded guerrillas more commonly associated with Latin America. Now, sitting on a crumbling wall across from us, Santana scoffs at the suggestion that La Piedrita might be even inadvertently serving the interests of the imperial enemy. Instead he catalogs the collective’s achievements: after the drug trade and the violence associated with it were stamped out, they turned to eliminating even private drug abuse and alcoholism and now were poised to confront domestic violence. Alongside the elimination of such scourges, the collective had long promoted alternatives, including cultural and sporting activities aimed at reinvigorating a sense of revolutionary community among local youth. In this struggle on two fronts—against threats to the community and toward the regeneration of its cultural fabric—Santana has given more than most. In 2006, his own young son Diego was killed alongside Warner López, another young member of La Piedrita (according to Santana, they were killed by members of another radical armed organization, José Pinto’s Tupamaro party). Later that same month, we were invited to ride along with these revolutionary collectives as the extreme left of the Chavista bloc made its displeasure clear in a caravan throughout the entire barrio of Catia, within which 23 de Enero is but a small part, insisting that “we are not terrorists.” Nevertheless, despite such militant pleas, tensions would only increase. In the year that followed, members of La Piedrita declared several opposition leaders “military targets,” they attacked the opposition’s television station Globovisión and other such targets with tear gas as “punishment” for crimes past and present, and Santana even publicly threatened the life Marcel Granier, the head of the other major opposition television network, rctv. In response, Chávez again declared them “terrorists” and issued an arrest warrant for Santana himself. Noting the difficulty of arresting members of such militant organizations (one previous effort to arrest Santana had failed), Chávez even insisted that he would “go get him myself” and made clear what was at stake, adding, with a feigned ignorance of the group’s history, that, “We can’t allow La Piedrita such-and-such to become a state of its own.” As a result of such conflicts, it might not be surprising to find critiques of Chávez on the far left: after all, these revolutionary militants now confront a Venezuelan state that, with its bloated bureaucracy, sordid corruption, violent police, and chaotic prisons, looks much like the state that had been killing and torturing them for decades. In preparation for the caravan of militias, a young woman wandered through the crowd, offering to paint revolutionary slogans on car windshields. When one angry militant insisted, only half-seriously, that she adorn his windshield with the phrase “Death to Chávez!” she gasped audibly. To fully grasp the relationship between these most revolutionary organizations and Chávez’s government, we must understand not only her astounded gasp but also the angry outburst that elicited it. In other words, we must attempt to grapple with the fact that the vast majority of such militants—those who deeply despise corruption, bureaucracy, and even the state itself and are more likely to associate that state with torture, murder, and “disappearance”—are still Chavistas, at least for the time being. I probe this peculiar tension during my discussion with Valentín Santana, attempting to wrap my head around a central element of the political process underway in Venezuela as a whole, namely, the relationship between the radical autonomy from the state that such collectives maintain and the unification of revolutionary forces to take and exercise state power under Chávez’s leadership. But such a fundamental tension, which in many ways constitutes the central theoretical problematic underlying this book as a whole, cannot be explained away easily. I ask Santana, this figure deemed a “terrorist” by the president and who that same president would soon seek to have arrested, what he thinks of Chávez. It is dark and so I cannot be certain, but his face seems to wear a smirk that suggests he foresees my confusion at the counterintuitive position he is about to assume: “Chávez is our maximum leader,” he insists. * Excerpted from the introduction to We Created Chávez: A People’s History of the Venezuelan Revolution. Copyright Duke University Press, 2013. George Ciccariello-Maher, teaches political theory at Drexel University in Philadelphia. 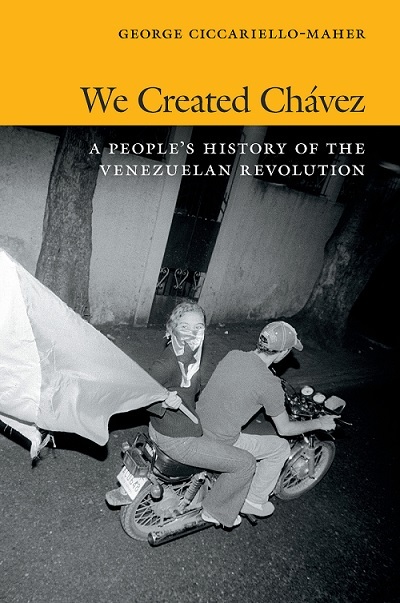 He is the author of We Created Chávez: A People’s History of the Venezuelan Revolution (Duke University Press, May 2013), and can be reached at gjcm(at)drexel.edu.